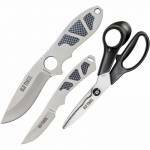 Featuring one of the safest Exchange-A-Blade options out there, a surgically sharp blade cuts through game easily, requiring no extra tool if you need to replace the blade on the fly. The OD Green handle has a large finger choil adds stability. The folding version of the original Vital Fixed Blade Knife, the ingenious Vital Pocket Folder EAB features one of the safest Exchange-A-Blade options on the market. 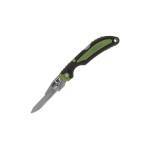 A smart mash-up of a replaceable utility blade with aOD Green rubber handle that won’t.. 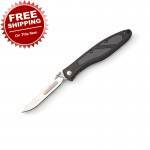 Features a longer and wider handle than the original but still uses the 60XT replaceable blades. 12 additional stainless steel #60A blades, 2-3/4" Super-strong military grade polymer handle Overall length 7-1/4" Ambidextrous thumb studs Open back for easy cleaning Liner-lock construction Removable holster clip Nylon holster included Fits #60A and #60XT blades ..
Our lightest, most compact knife set with hard-side carry case is perfect for field use and home processing. 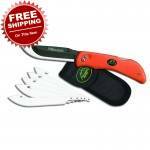 Weighing just 20 ounces, this complete 6-piece set includes a full-tang caping knife, gut-hook skinner, boning/fillet knife, game cleaning gloves and two-stage ceramic/carbide sharpener to maintain a razor edge at all times. The 420J2 stainless steel blades are precisely heat treated and hand finished shaving-sharp. 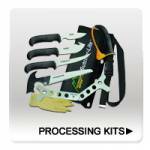 Rubberized, blaze-orange TPR handles offer high visibility in the field a..
Light-weight, 8-piece game processing kit with all the tools to get the job done. Comes complete with full-tang caping knife, gut-hook skinner, boning knife, carbide sharpener, wood/bone saw, ribcage spreader and game cleaning gloves all in a hard-side carry case. Non-slip rubberized blaze-orange handles never get lost and feature a horn pattern inlay for enhanced grip. Full-tang caping knife Gut-hook skinner Boning knife Tungsten carbide sharpener Wood/bone saw Ribcage spreader ..
7" closed. 11" open. Pivoting steel bar designed to spread brisket for easy field dressing. Enables quicker cooling of fresh game meat. Nylon belt sheath included. 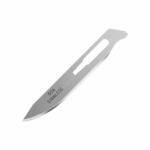 ..
Havalon Knives #60A Stainless Steel Replacement Piranta Blades - One Dozen. 20% thicker and 30% stronger than the #60XT blades. 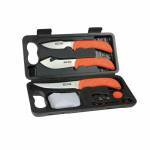 Perfect for skinning, quartering or field dressing and able to withstand heavy use and resist breakage. 2-3/4" length. 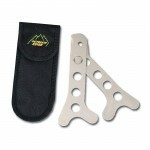 Fits all Piranta-Style knives. Individually foil wrapped. Box of one dozen. ..